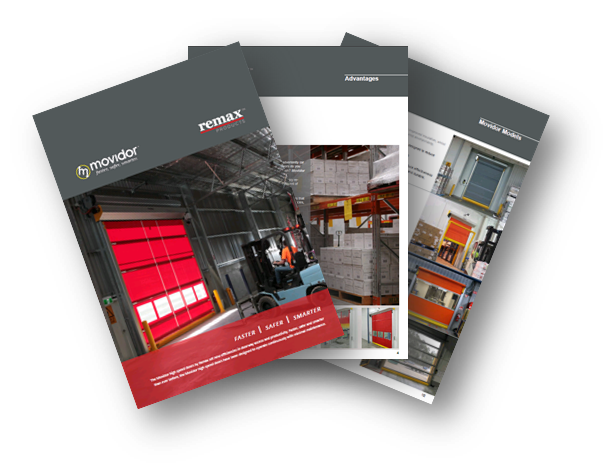 A Free Download - Movidor High Speed Door Brochure. Movidor high speed roller doors are Faster, Safer and Smarter. Designed to operate continuously in warehouses, food and beverage processing, distribution and logistics facilities, coolrooms, manufacturing facilities, car wash facilities and many more: with minimal maintenance due to the self-repair feature which reacts to impact and relocates the curtain back into the guides. Movidor HS25 High speed roll up door for small interior doorways up to 3.0mH x 3.0mW. Movidor HS35 High speed roll up door for medium interior and exterior doors up to 4.0mH x 4.0mW. The HS35 is suited to constant, high-repetition cycles for interior and exterior doorways. HS65 High speed roll up doors for large exterior doorways up to 6.0mH x 6.0mW. The Movidor HS65 has been designed for large external doorways, with significant wind load.